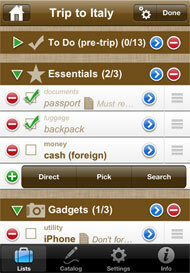 Packing for the Big Trip – There’s an App for That! For us, one of most stressful parts of traveling is making the decision of what to take along in the first place. In the past, scattered around the house would be scribbled notes, Post-it’s, crossed out lists and crumpled papers – and that was just for a weekend away! Now that we’re planning to be gone a year or more, it’s really getting serious. When the commercial says, “there’s an app for that”, they aren’t kidding. Packing apps are springing up for all platforms of Smartphone, iPad and computers. These cater to frequent, business, family, weekend, and long- term travelers as well. Maybe this is exactly what we need to de- stress the packing process. But is an app better than the trusty paper list? Here’s what we found about two of the top apps for travel packing. We decided on the Pro app and Lisa began the process on her iPad. Instructions were read and by the seventh option to “create a new list” she started to go cross eyed. Twenty minutes later she had created a few pretty backgrounds and knew she was only bringing 3 pairs of shoes, but that was about all. 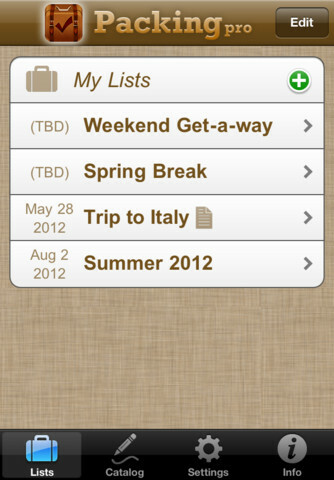 Wandering around through the app a little more still didn’t make our packing list miraculously appear. The takeaway? It’s back to ordinary pen and paper for us – crumpled notes and lined legal pads will soon be covering our desks. I’m sure packing apps have a place for some travelers, but maybe we’re just not tech savvy enough to use them at their full potential. Have you ever used a packing app? What did you think – essential for travelers or just another time sponge?